Comet C/2009 R1 (McNaught) is still 2 weeks from perihelion (its closest approach to the Sun). Unfortunately it has become a difficult object to see as it is located very close to the northwest horizon in evening twilight and close to the northeast horizon in morning twilight. Also not helping is the fact that the comet’s brightening trend has stalled for the past 2 weeks at magnitude 5.0 to 5.5. More on that later today when I present another analysis of its lightcurve. 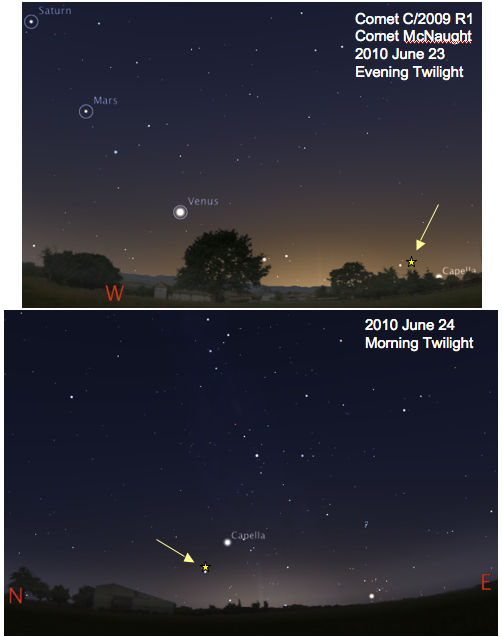 Last night I woke up early in the morning and attempted to observe the comet. Luckily for me the comet rose above the mountains right between 2 trees to the northeast of my house. Though visible in 10×50 binoculars, the comet was only slightly fuzzy and I probably would not have recognized it as a comet if I wasn’t already looking for it. At magnitude ~5.5 it might have been visible as a faint star to observers under very dark skies. Below are rough finder charts for finding the comet this evening and morning. Though visible in the evening, the comet is easier (relatively) to see in the morning sky. Regardless of morning or evening, you will need an unobstructed view of the horizon. Also binoculars or a telescope will help. If you are lucky enough to live where it is very dark, then you might see if with just your eye. In that case the comet will appear as a faint star. In small binoculars, the comet will appear as a slightly fuzzy star (though under dark skies a tail may be visible). With larger binoculars or in a telescope the comet should be an obvious blue-green “fuzz ball” with a faint tail extending away from the horizon. 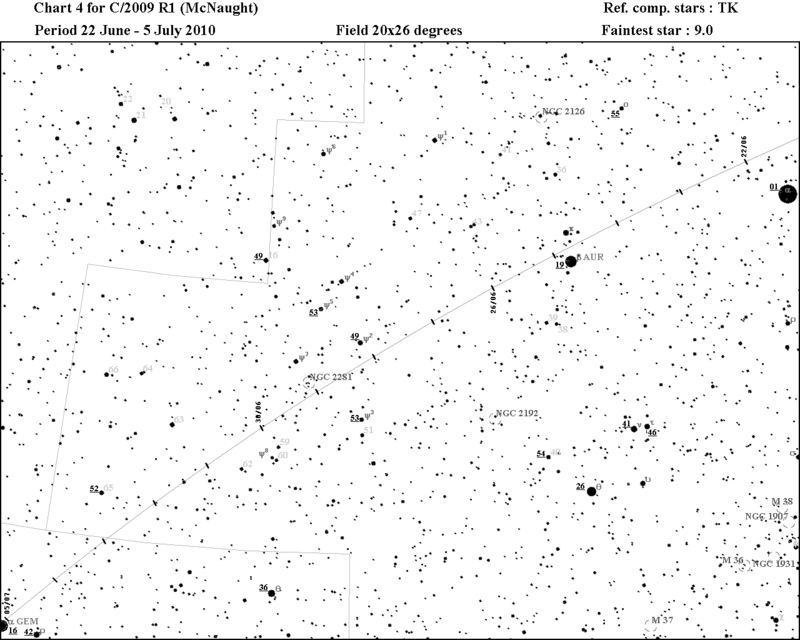 Try using the bright 0th magnitude star Capella as a guide to where to find the comet. For observers requiring a better, fainter star chart, try this one. Finder chart for finding Comet C/2009 R1 on the evening of June 23 and morning of June 24. Created with Stellarium. This information is really very much appreciated! By the way how can I show the comet in Stellarium? I guess it is not a default option.Thanks! I live in N.Ireland and would it have been possible for me to have seen the comet last night?? It was 1.20am and I just seen what I thought to be a very bright star. I was facing south and ‘the star’ was coming from my right to left. Could it have been the comet?